Beautiful Crochet Granny Square with a Heart - FREE Pattern! 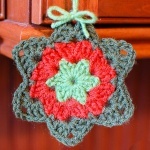 Home » Patterns » Beautiful Crochet Granny Square with a Heart – FREE Pattern! Beautiful Crochet Granny Square with a Heart – FREE Pattern! Just perfect for Valentine’s Day…or any day! This granny square with a red heart in the center is an elegant and beautiful design and it’s easy to crochet! It makes for a wonderful addition to your Valentine’s Day themed decorating and gift giving. And of course, it’s great all year round; hearts are always welcome. This beautiful square is so versatile, too. Just think of the blankets and afghans you could make with this. As a single, it would also be a fabulous potholder or trivet. Yes, this is a fantastic pattern and it’s free! 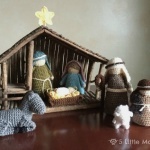 It’s by crochet designer and blogger Kara of Petals to Picots. She gives you a written pattern that will guide you to success even if you’re relatively new to crochet as she gives you links to tutorials on all the techniques in case any of them are new to you or you’d like a refresher. You will also find a very helpful chart. And now for even more fabulous and free patterns and tutorials for all kinds of granny squares be sure to check out some of our favorites here at Crochet Maze! Links below!